Reduce mud and manure build-up. Mud creates unsafe and slick footing and can be harmful to the environment. Create a healthier environment for you and your livestock and make chores easier. Eliminate the mud that creates a breeding ground for insects and harbors bacteria, fungal organisms and other pathogens. These can cause disorders such as abscesses, scratches, rain scald or thrush. Reduce sediment runoff which contaminates surface water and is detrimental to fish and aquatic life. Pick a dry, well-drained area away from existing steams, ponds, wetlands or other water. Use footing material suitable for your area and soils, placed over geotextile fabric. Install gutters and downspouts on all buildings and divert water away from heavy use areas. Protect downspouts from livestock damage. Fence the heavy use area to enclose animals during the wet months or when pasture is grazed down to 3” or less in the summer. Once a heavy use area is installed and in use, be sure to maintain it for optimal use. Pick manure every 1-3 days and dispose of it correctly. If any material is moved, replace it and be sure the fabric stays buried. Your local conservation district can help you pick a site and determine the size you will need. There are many reasons to manage your manure correctly. Manure creates an unhealthy environment for livestock, creating more vet bills and increased feed costs. By composting livestock waste, you reduce the chance of runoff from your property becoming contaminated and contributing to pollution of surface water and groundwater. Polluted run-off can be detrimental to fish and other aquatic life. Compost also improves the tilth of your soil and can be a soil amendment. Install a three-pile compost bin system. One for fresh manure, one in the decomposition process and one ready to spread. Store the manure in a covered area, either with a roof over the bins or a tarp. This keeps the rain from leaching away nutrients. Turn the compost pile regularly if possible. This helps aerate the pile and speeds composting. Monitor the temperature of your compost using a compost thermometer. Check moisture too, make sure it’s not too wet, or too dry. It should be like a wrung-out sponge. Get your compost tested so you can apply at the right rates. Once the compost is ready (it should smell like soil), you can apply it to your garden*, crops or pasture. Proper grazing management and pasture rotation produces more grass, fewer weeds and reduces bare ground. This will save you money by lowering feed costs, colic risks and reducing veterinary expenses. To create a healthy field of grass, subdivide large pastures into smaller pastures and develop a rotational grazing system. This will eliminate over-grazing and give your pastures time to recover which provides the best grass (and nutrients) for your livestock. Continuous grazing allows weeds to grow where grass roots have been weakened. If your grass has not had adequate time to recover in any of your pastures, hold and feed animals in a heavy use area. Move livestock into a pasture when grass is 6” to 8” and move them out when the grass is grazed down to 3”. Each pasture should be rested for 28 days before re-grazing. Test soils in pastures to determine if you need to add any amendments and to make sure you are applying at the right rate. Over-applying fertilizer can be harmful to animal health, plant growth, and the environment. To amend your soils, use compost to improve tilth and add nutrients. Supplement with fertilizer if needed, based on soil tests. Compost should be applied only during the growing season when plants can take up valuable nutrients. 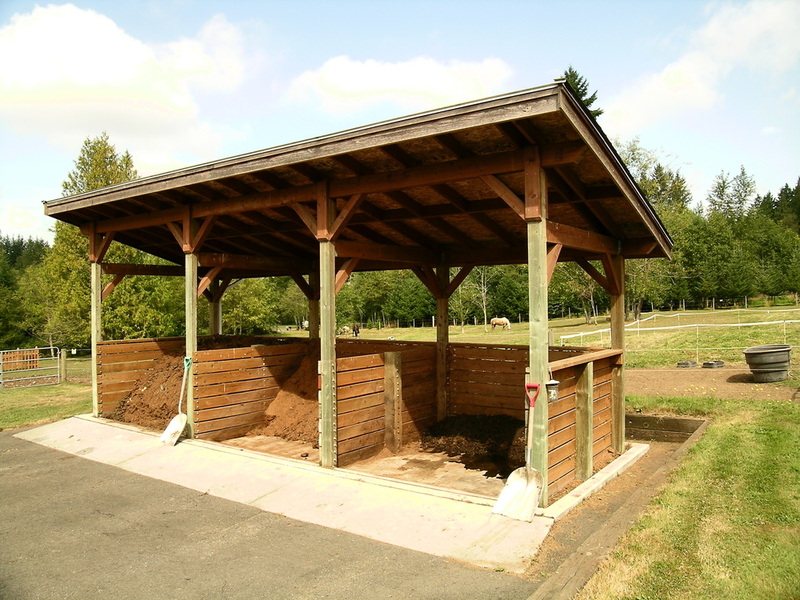 * When applying composted manure to gardens, it should be composted for 180 days or more. Contact a farm planner at your local conservation district for questions. Snohomish Conservation District farm planners can be reached at 425-335-5634 or farmplanners(at)snohomishcd.org.